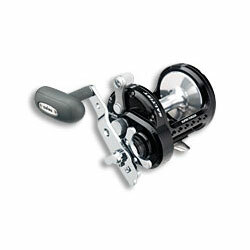 The Daiwa Saltist Black Saltwater is no longer available. To find a comparable reel, please use the menu to the left. "I combined this reel with a 6'6" 20-50lb Shimano Tallus (SBA) rod, and 40# clear Ande. I then headed to the Dry Tortugas for some bottom fishing. I caught many fish with the largest being a 53lb Amberjack. In all cases the reel performed great, and the AJ was no match for the reel's smooth drag system. I highly recommend this reel." "i purchased two of these reels, i use them for jigging for cod and haddock in new england in depths of 200'-350' the fast retrive ratio is awsome. the drag is very smooth i'am ordering a third this week."